Author and Vietnam veteran Charles M. (Chuck) Grist led the C.O.B.R.A. Team during dangerous convoy missions in Iraq. Stationed in Baghdad during 2004 as the Protective Service Detail for a general, the team faced the possibility of death from ambushes, improvised explosive devices, or rocket and mortar attacks. Based on his detailed war journal, Grist tells the story of his team and describes some of the heroic and extraordinary deeds of America’s warrior-citizens, the men and women of the Reserves and the National Guard. The author also completed his own journey of war which began a generation ago in Vietnam. During his first war, he was a young, inexperienced soldier and leader. He entered his last war as a combat veteran, a grandfather, and a long-time police officer. 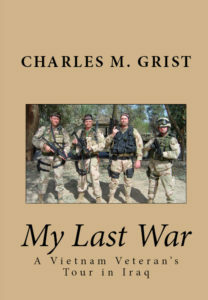 Grist’s personal mission in Iraq could only succeed if the general and the men of the C.O.B.R.A. Team returned safely to their families. To survive their tour, these American warriors needed all of their skills, a lot of luck, and an unswerving dedication to each other. Each and every day, the ruthless Iraqi insurgents would look for an opportunity to kill them all. 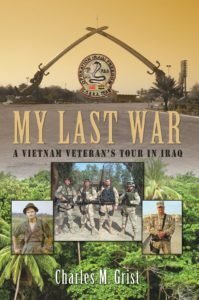 The first edition of “My Last War: A Vietnam Veteran’s Tour in Iraq” was published in 2009 and is still available on Amazon.com. You may go to the link HERE for the first edition.